When students with disabilities turn 21, or receive a high school diploma, their entitlement to special education services ends, and the school bus stops coming to their corner. Before the school bus stops, the school and the adult program need to collaborate and plan for what happens after the school entitlement ends. Unlike entitlements, eligibility for services does not guarantee access to, or acceptance in, a program. Transition is a formal process that begins by age 16 for a student who receives special education services in the United States. At this time, the school system must begin helping those students plan for their lives after high school, whether it is employment, college attendance, vocational training, or independent living and adult disability services. As part of the transition process, students should be encouraged to consider their interests, abilities and preferences and how these issues will affect their vocational opportunities. Transition from adolescence to adulthood is a challenging time for all students, regardless of disability, but it is especially problematic for students on the autism spectrum due to social and communication problems. These young adults and their families must learn to navigate multifaceted adult care systems and manage complex service needs. Paul Wehman’s Project Search (Wehman, P. et al., 2012) demonstrated that setting goals for employment, providing successive internships in community businesses, and establishing collaboration between the school and the adult service staff helped transitioning students to find and retain employment. 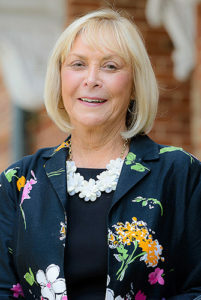 Wehman’s research also revealed that intensive instruction in social, communication, and job skills, combined with the provision of visual supports and the establishment of work routines and structure, were crucial to successful transitioning. 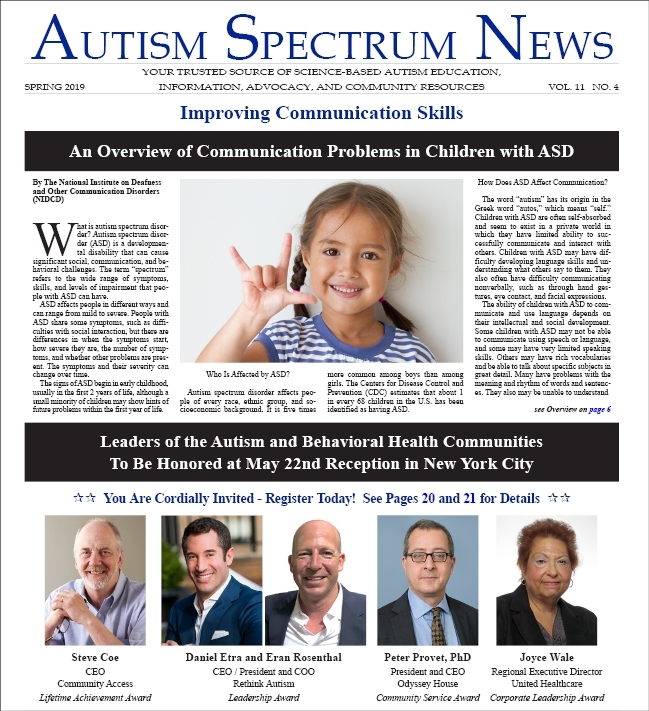 There is a growing body of research that indicates that with the right type, level, and intensity of support, individuals with Autism Spectrum Disorder (ASD) can work in a variety of jobs in the community (e.g., Wehman, 2016). This issue is crucial given the fact that the unemployment rate for people with disabilities is approximately 75% (Eckstein, Savak, & Wright, 2017). 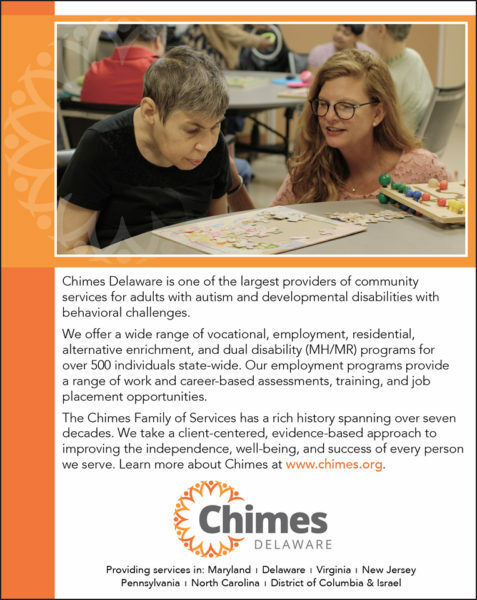 Chimes Delaware is committed to the model described by Wehman and provides a variety of employment services to students with ASD who are transitioning from high school to work. Although Chimes offers a continuum of vocational services, an individual can begin the program wherever his interests and abilities place him. Individuals with the requisite skills can directly enter supported or competitive employment without going through the prevocational program. The key to Chimes’ success in transitioning is matching the vocational program to the wants and needs of the person with ASD. Chimes’ philosophy is to place individuals with ASD into positions they find fulfilling. Then as their skill sets develop, opportunities may open for even more gratifying positions. Day Habilitation Services – Chimes provides a Day Habilitation program that emphasizes the development of the socialization and daily living skills that will allow its participants to achieve a greater degree of independent community living. Chimes’ services are based on Individual Service Plans. Pre-Vocational Services – Pre-Vocational Services teach the general and soft skills that contribute to the person’s employability relative to an identified vocational goal in the participant’s Individual Service Plan. The services may include activities to improve the person’s attendance to task, her engagement in safe employment practices, her ability to solve problems that arise in the work place as well as her social and communication skills. Supported Employment – Chimes provides Individual Supported Employment to “client employees” in 18 community business settings. Each participant is supported by a 1:1 job coach according to his need for on-going support to maintain the job. Job coaches visit the site where the individual is employed and support him for the entire job shift. Average shifts are 3.5 hours per day, 3-4 days per week. Job participants are paid at or above minimum wage. In addition to specific job skills training and support, job coaches also provide additional services that help the individual to be successful in the job setting. Small Group Supported Employment is provided to “client employees” in 39 community business settings. Job coaches work with the participants and employers to ensure satisfactory performance and to take corrective actions when needed. The job coaches teach skills in addition to those required to complete a task. These may include: social skills training, training in appropriate communication and work place conduct, and teaching other skills necessary to be successful in a job. Chimes is able to transition individuals through a continuum of services based on their preferences, growth toward independence or the need for more intensive supports. Our partnerships with government and public sector businesses throughout Delaware allow our participants to move into fully integrated employment, consistent with Delaware’s Employment First goal. Chimes Delaware also provides transitioning services to people with challenging behaviors. Behavior analysts work closely with job coaches to assure that inappropriate behaviors do not interfere with job performance. 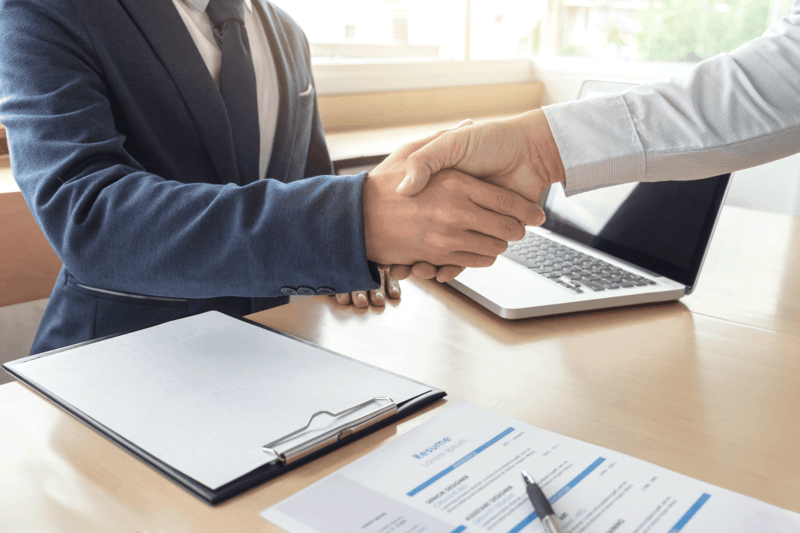 When an individual enters the employment program, a thorough assessment is performed to determine the abilities and the interests of the individual. A functional behavioral assessment is performed to determine the reason for any inappropriate behaviors. A behavior plan is written to decrease inappropriate behaviors that could interfere with job performance. Data are collected and analyzed by the Behavior Analysts to assure that inappropriate behaviors are decreasing and that the Behavior Support Plan is effective. Chimes is currently piloting a Virtual Health Automated Data System. Research is being conducted comparing the old paper and pencil system with the new automated data collection system. With Chimes, jobs are tailored to fit the needs and desires of the individual. Some employees work a morning job, take paratransit home, and are home for several hours before going for a second job. They need that break. Some individuals have worked at the same company for 20 years. Other individuals prefer to change jobs and have new experiences. Volunteer opportunities are used as a way to give back to the community and to offer participants the experience and confidence they need to find paying jobs. Chimes has provided employees to more than 30 companies throughout Delaware using a variety of models to fit the needs of the individual. Chimes is constantly searching for ways to expand employment opportunities. Behavior analysts work closely with job coaches to assure that inappropriate behaviors do not interfere with job performance. Earning a pay check and having money to spend on desired items is very gratifying for most of our workers. Individuals who need more immediate rewards can earn a daily token which can be exchanged at the end of the week at the Chimes store. Chimes employment program capitalizes on what people can do and has demonstrated that people with autism can be highly productive citizens when given the opportunity. If you have any questions or need additional information please contact Dr. Meszaros at 302-452-3400 or lois.meszaros@chimes.org. 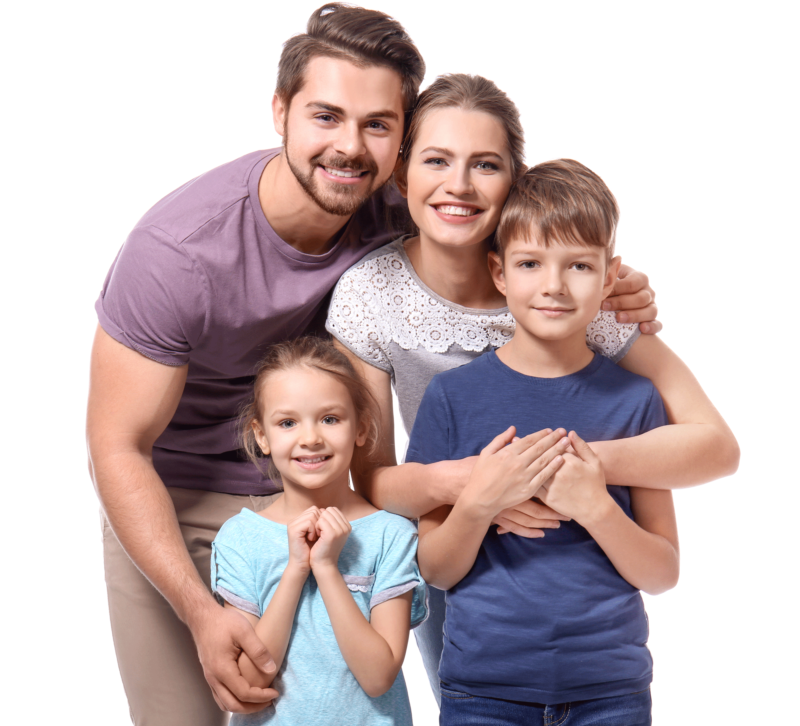 For more information about Chimes locations and services please visit our website at www.chimes.org. Eckstein, A., Savak, P., & Wright, D. (2017). Personal characteristics of vocational rehabilitation applicants: Findings from the Survey of Disability and Employment. Journal of Vocational Rehabilitation, 46, 177-185.